I’ve been a football fan long enough to see the way so many clubs are run. In 2003, Roman Abramovich completed his takeover of Chelsea and pumped a whole lot of cash into the club’s coffers in his bid to make them a dominant force in a league that was utterly dominated by Manchester United and Arsenal. Claudio Ranieri was the man that was brought to start the Chelsea dream and after wasting funds on the likes of Adrian Mutu and co., a clearly dissatisfied Abramovich axed him from the club and brought on the Champions League winner from FC Porto, Jose Mourinho. The Chelsea gaffer bought some of his goons from Portugal, Petr Cech, Arjen Robben and Didier Drogba to win the Blues’ first title in 50 years. Did other teams take cue from this? Of course yes! The Arab oil magnates from the UAE bought Manchester City from Thaksin Shinawatra and his entourage and they began a splurge that finally saw the Citizens win the Premier League two times in the past three seasons. These folks also took over New York City FC and some Arab folks flexed their financial muscles to take over PSG with the same thing happening in the love capital of the worl – more spending. “I still hope, one day at the right price, that I will buy the team. I might buy it, not at a ridiculous price but a price that the owners won’t want to resist. I know my strategy. Five years ago, Dangote tried to acquire a stake in the club but he was unsuccessful. 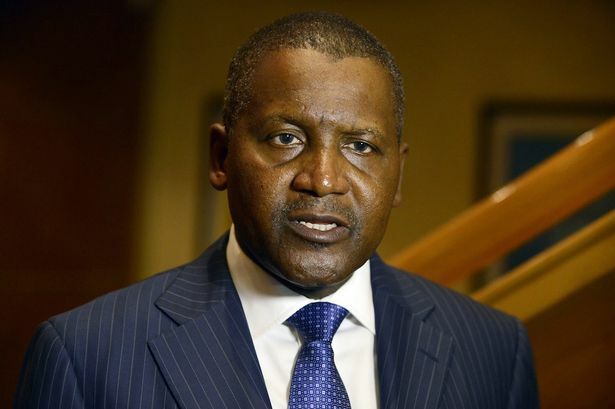 According to Forbes, Dangote is the 67th person in the world but he’s the richest African. He is also worth nearly eight times as much as when he tried to buy into the Gunners last time. And he used to be even richer before the devaluation of Nigeria’s currency. Arsenal is currently owned by Stan Kroenke that has been renowned for his ‘silent’ approach in handling the affairs of the club. Many have accused the American businessman of not ‘having enough ambition’ as he seems to be ‘ok’ with the club just qualifying for European football instead of challenging for major honors. Many feel he should do more at the club but fervent supporters of the club should know that the club is heading in the ‘right direction’ with the new financial deals put in place as well as available transfer funds at the manager’s disposal which has been used in signing world-class talent like Mesut Ozil and Alexis Sanchez. While Dangote’s interest in the club is welcome, we should remember that there’s a certain Alisher Usmanov that has desperately tried to increase his 30 percent stake at the club and that hasn’t been fruitful. Usmanov has made his intentions for the club made known to the public times without number and he has been critical of some performances in the past. Dangote is a self-professed Arsenal fan and he’d want to have the club’s best interests at heart. Passion can be a good driver for such aspirations but sometimes it’s never enough. The current Arsenal management has done a splendid job in marketing the club to various countries in recent times. The Asia Tour last season was a massive success and the club has some footing in Dangote’s country, Nigeria. Arsenal is currently collaborating with Sterling Bank and Malta Guinness as well as other ventures in the country. The only ‘issue’ I had with Dangote’s interview was when he stated that Arsene Wenger needs to change his style and the club needs a new direction. These are the kinda quotes a sugar daddy would say. The kinda sugar daddy that would pump a lot of funds for the club with aspirations to win the Champions League for instance and when that doesn’t happen, he’d request for the manager’s head to be on a guillotine and he’d let the big knife drop. If a manager like Wenger, that’s very used to getting things done his way is ‘pushed to the limit’ by a chairman like Dangote for instance, he could be off. Looking at this issue from another perspective, does Dangote know how to run a football club? Just because you are a fan of the club with lots of money doesn’t mean you know anything about the game or how a team is run. Dangote has made his fortune from the things he’s really good at and there’s no part of it that has anything to do with sports. Many Nigerians are proud of Dangote’s achievements but his dreams about buying Arsenal may never be a reality. Posted on May 7, 2015, in Arsenal, Football, Premier League and tagged Aliko Dangote, Arsenal, Football, Premier League. Bookmark the permalink. 3 Comments. I admire his intent to want to buy arsenal fc but he has to also go through some learning about what it takes to run a football club. That aside the current arsenal board need to clearly define what they want come 2015/2016 season cos I absolutely agree with Henry when he said the team need at least 4 quality players to really challenge for the league. We are just a few players away from challenging.